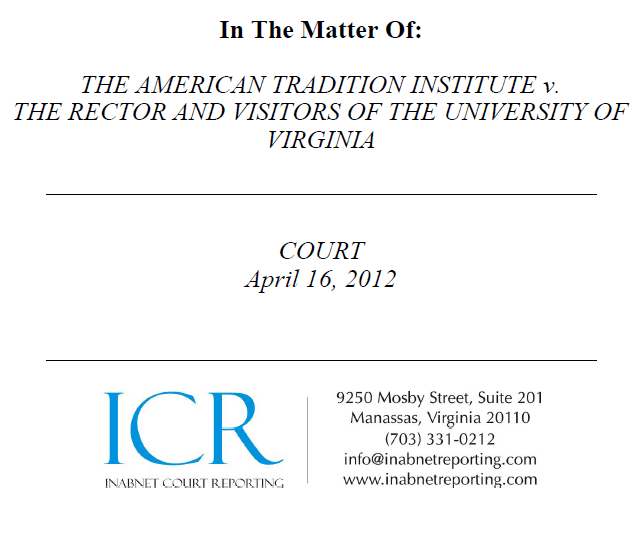 Court fight: Mann's lawyer and UVa counsel -vs- ATI | Watts Up With That? UPDATE: Link to the full court transcript added below. It seems that Dr. Mann’s lawyer and the UVa counsel are arguing strongly that Mike Mann’s emails are somehow “special”. But, the judge doesn’t seem too impressed, especially with his “purity of heart” remark, and he’s right, the law is blind to that. It seems to me that there must be something quite damning in those emails, or they would not be fighting so hard to prevent their release. I mean seriously, the “hockey stick” is a world known bit of science, what could possibly be so “proprietary” that is warrants an exception for Mann where Wegman, Singer, Michaels and others at UVa have none? Some excerpts below, followed by a PDF of the partial transcript with highlights. 13 Virginia in this matter, his former employer. 13 research on issues such as paleoclimatology. 16 MR. FONTAINE: Yes, sir. 20 forum all the time. 1 the legal right to FOIA protection? 3 test before we apply FOIA’s legislative acts? 6 Court’s function to try to weigh the motives. 8 arguing that to me? 20 production, or is it the university? 22 to get to that. 2 interrupting you and let you go then. Go ahead. 7 University. He lives in Pennsylvania. 15 of a protective order review. 1 an improper invasion of his rights. 2 case that we have here. 19 DR. SCHNARE: Yes, sir. 22 means under Virginia law. 13 find something useful in it. 18 and the intervener want to prevent. 1 academic freedom, neither did anyone else. 6 and they had none of their own. 16 this case, or any other group. 22 interest in those e-mails, either. 9 And who, Your Honor, is this author? 17 passed peer review and open to public review. UPDATE: The full transcript is here on ATI’s website. Love the story at the end. Still not sure they won’t find some new loophole though. Wouldn’t it be lovely if they have to release them and the whole CAGW thing is destroyed out of Manns mouth though? This is a car crash in slow motion. And I’m loving it. Maybe Mann’s emails have all sorts of contacts with BP, Royal Dutch Shell, and other big bad oil companies and their fellow traveling NGOs. Revelation of such will make for lots of good jokes. It will also provide fun watching the Ayn Rand-type lunatics try to figure out “How come those guys aren’t on our side?? ?” There could be lots petty nasty stuff too, even better! Wonder if he isn’t hiding any more CAGW flaws, but is concerned other activites that would sully his name are described. Nothing illegal perhaps but something along the lines of how he enjoys to much scotch or something more ‘damaging to his character.’ Frankly I think most will ignore things like that. I only really care about his research. We don’t need wind power … just couple a dynamo to the ghost of Tom Jefferson. 36000 RPM. 2 public have to trust scientists? Hoist on their own petard – a nice argument. Righteous inner certainty and self-diagnosed purity of heart: the new criteria of truth, morals, and legal immunity brought to you with cynical sincerity by Michael Mann and the AGW crowd. Could you reformat this so that it’s readable? Did Prof. Mann’s lawyer forget to advise Mann that he should copyright his e-mails if not also his infamous hockey stick? The longer this goes on, the more I’m certain that we’re going to see something truly ruinous to Mann and those who’ve embraced Mannian science. That is, IF we see anything. Holy crap! Devestating… Oh man, to have been a fly on the wall…. Attorney: Mr Mann’s motives are oh so noble and therefore he is except from the rules. The Court: Purity of heart doesn’t matter a jot, even in the unlikely event his heart is as pure as the driven snow. Methinks Mr Fontaine needs to make some “adjustments” to his presentation of the evidence. Between this and the ACA before SCOTUS, I have seen some good lawyering, and some really bad. Fortunately the good guys have been doing well. It appears Mann’s lawyer is a co-conspirator. Can a lawyer get disbarred by lying to a judge after the judge expicitly tells him to avoid a particular argument and he goes right ahead with it anyway? Hide the data, hide the decline, hide FOI emails. Hide, hide, hide behind….. The group think fortress is slowly coming down as they retrench. Isn’t Anthony’s dog a member of this group? Bad dog! is the full transcript available anywhere? That last bit about Mann using Wegman’s FOIA’d emails is rich. Say what??? Where did that uncalled for attack come from? Please explain what you’re talking about. Ayn Rand was an internet troll before digital storage was invented, Bob. Maybe Mann’s emails have all sorts of contacts with BP, Royal Dutch Shell, and other big bad oil companies and their fellow traveling NGOs. That information would have about zero effect. It’s well and publicly known that Shell and ExxonMobil have been playing a significant role in the University of East Anglia climate research unit. Big oil companies support for the warmists has had no outcry, it’s just the skeptics that would be crucified if there were any connections. How could you not have it in front of you? I wonder if Mr Fontaine got his law degree at the Holiday Inn Express he stayed at last night. That won’t help – to copywrite something, it has to be submitted in full to the library of congress. Also copywrite protects the intellectual property interest (I’m not sure ‘intellect’ applies to most emails, but I digress). If they were copywrited, they’d be part of the publicly available materials, and as such could be used by the VA AG. It really demonstrates what sort of a character Mann is. Happy to dish it out but cannot take his own medicine. I will stop before I am snipped. Is the PDF file you uploaded all you have, or do you have the full transcript? It would be nice if those interested could look at the entire thing rather than just excerpts. I was contemplating a long answer how Rand’s idolization of “industrialists” is merely her inversion of Leninist avant-garde leadership ideology, and the replacement of Marx’s labor fetish with a fetish for management. I wish I could point to a recent thread about nuclear power where the Randista-types went into hyper-ventilating overdrive of righteous indignation when confronted with the reality the nuke industry supports CAGW efforts, and such would profit that industry. They can’t follow the money unless it comes from the gubmint or someone they can categorize as “left wing.” But that thread was pulled. It was a great thread, there were two or three actual nuke insiders who confirmed, yes, indeed, the Nuke industry supports CAGW-based efforts. This only made the Randista-types (business worshippers) go even more ballistic. The State of Virginia has FOIA laws for citizens to know what the government of the State of Virginia is doing. Employees of the State of Virginia are part of the government of the State of Virginia. The UVA is a State of Virginia chartered/funded institution. The UVA is an institution which legally is owned by the government of the State of Virginia. Employees of the UVA work for an institution of the State of Virginia so are defined as public employees. Mann was employed by the UVA and therefore was a public employee paid by the State of Virginia. The State of Virginia public employee named Mann while working at the UVA received government grants ($) for research. ATI filed an FOIA request for Mann’s info related to his public funded research while he was a public employee at the public UVA. The UVA and Mann reject the FOIA because Mann is special. Outside pressure groups are exerting pressure on UVA to resist complying with the Virginia FOIA law. The administrators of the UVA are failing to protect the public interest wrt the spirit of FOIA and they are corrupting the scientific community by allowing pressure groups to subvert its public duty. Not sure how people send stuff, but here’s a link that deserves comment. “There are,” as my lawyer brother-in-law says, “none so stupid as those who waste a judge’s time.” The judge’s words are a warning to UVA and Mann that he wants pertinent information that will clarify each side’s views about the legal aspects of the FOIA issue. What appears to be really interesting is that ATI is arguing that the AGW-side of the debate has already set the legal precedent. Mann has even sought through his book to monetarily profit from it, and thus cannot now seek for an exemption. Mann and his palls have already established the precedent. This is especially interesting because where the State Attorney General asking for those emails would in effect require Mann to give up his 5th Amendment rights, if the judge finds in favor of ATI, the very evidence the AG sought may appear after all. That could explain a great deal of desperation on the part of UV and Mann. I can’t wait for the movie version. What if, for general purposes, all of those bad motives are true? How does it effect the legal right to FOIA protection? Mann’s lawyer’s actions in this case seem to be a literal comedy of errors – I find it very, very funny. At the beginning I didn’t think the public would find anything that damning in his emails. We already know that Climatologists fudge data to fit their beliefs so I was just expecting more of the same to come to light. Now I am starting to wonder if he isn’t hiding something that could be even more damaging to his reputation and to climate “science” in general. If there is a climategate 3 email release, I wonder if it will come before Rio+20? Not quite right. In the USA, everything a writer produces is copyrighted as soon as it is written. Now, proving YOU are the owner of the copyright is another issue, which is why one should submit the written material to the copyright office. The copyright office will date it and then you have a document to prove the origination date. One can also send oneself a registered letter and keep it unopened until proof is needed to date a claim of origination. It is only an issue when a dispute arises as to who wrote it first. It does not protect against using the material with proper citing. On the other hand, trademarking does protect against the unauthorized use of a mark. If Anthony has trademarked the “WUWT” logo at the top of the page, no one can use it without his permission. Can you imagine being on trial for murder, and your lawyer pulls a stunt like that? “Well your honor, I don’t have the law in front of me (that you are arguing at that moment?! ), but it basically says…” Fired. I would find new counsel immediately that actually knew what it was doing. The law BASICALLY SAYS?? You’re talking to a judge, not a 12 year old. In terms of waiver, I deny it without prejudice. That isn’t very satisfying, doesn’t give anybody a clear sense of victory or loss; but, procedurally, that is the controlled way in which I want to go read the exemplars. “It is denied without prejudice” in my mind means I have denied it, but I will hear you again if and when necessary. Doesn’t sound like UVa was routed. I can’t shake the feeling that Fontain knows how bad his position is and doesn’t care because the fix is in. Does anyone have any idea how long until this court case is decided and (hopefully) the emails are released? I was contemplating a long answer how Rand’s idolization of “industrialists” is merely her inversion of Leninist avant-garde leadership ideology, and the replacement of Marx’s labor fetish with a fetish for management. It seems to me that someone didn’t understand Atlas Shrugged. That’s too bad, because there are some real gems in there. I was contemplating a long answer how Rand’s idolization of “industrialists” is merely her inversion of Leninist avant-garde leadership ideology…. From the little I know about her, I got hauled off to the movie, Rand disliked corporate- government collusion which is exactly what we are seeing happening today. Looks like he is getting what he paid for. …probably through me not conveying my thoughts very clearly to the others, definitely overstates any singular confidence I have in my own results. I’ve just completed Mike’s Nature trick of adding in the real temperatures to each series for the last 20 years (i.e. from 1981 onwards) and from 1961 for Keith’s to hide the decline. …they’ve gotten the (Bush) White House Office of Science & Technology taking it as a serious matter (fortunately, Dave Halpern is in charge of this project, and he is likely to handle this appropriately, but not without some external pressure). …so it is best to clean up the programs and provide them to some of my close colleagues in case they want to test it, etc. I’m not sure that Geophysical Research Letters can be seen as an honest broker in these debates any more, and it is probably best to do an “end run” around Geophysical Research Letters now where possible. Scott really screwed up big time when he established that directory so that Tim could access the data. Yes, the BBC has been disappointing in the way they’ve dealt with this—almost seems to be a contrarian element there. …the last two on the list (with question marks) would be unwise choices because they are likely to cause conflict than to contribute to consensus and progress. Of course, if it does get published, maybe the resulting settlement would shut down Energy and Environment and Benny and Sonja all together! We can only hope, anyway. So maybe in an odd way it’s actually win-win for us, not them. The threat of a lawsuit alone may prevent them from publishing this paper, so time is of the essence. Would you mind giving us an advance copy? We promise to fully respect Nature’s embargo (i.e., we wouldn’t post any article until the paper goes public), and we don’t expect to in any way be critical of the paper. We simply want to do our best to help make sure that the right message is emphasized. Phil to Mike: Can you delete any emails you may have had with Keith regarding the latest Intergovernmental Panel on Climate Change report? Mann: I’ll contact Gene about this as soon as possible. …if he does get his criticism “published” it will be in the discredited contrarian home journal Energy and Environment. Email 1256735067 – As we all know, this isn’t about truth at all; it’s about plausibly deniable accusations. For what it is worth I have been informed by a representative of UVA that their honor code applies to students only, not to instructors or to staff. Well, well… I’ll believe it leads to anything when Mike Mann’s daily view of the sky will be squared. I haven’t heard yet of a single case of a government-sponsored professor or a government-agency thug being sent to prison for their misdeeds. Don’t know about “global warming” (it’s rather getting colder and colder these days) but a Global Sovietization is evident, and it is certainly of anthropogenic nature. I just read the entire transcript in detail. The UVA lawyers are good, but I think it’s obvious that they are simply making legal arguments to protect a climate scientists and that they wouldn’t be making the same arguments for the other side. The judge seems smart, and it seems as if he will realize that UVA’s arguments are simply being made for convenience. Overall, I expect, for whatever my expectation is worth, for him to rule in favor of having a good majority of the emails released. 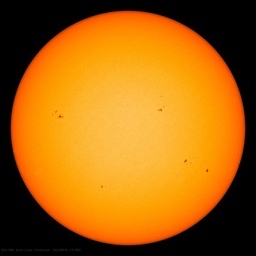 This has silenced many scientists at NASA and it takes quitting before you can respond or openly discuss science. Wow. I am so glad I read that through to the end. What an argument. This sort of thing only appears on TV. Judge Sheridan appears to be pretty astute. The ATI counsel was pretty thorough in nailing Mann as a non citizen and non-employee and therefore UV essentially waived rights when it sent Mann the tranche of emails that had not been already destroyed. If I wss Mann I would be nervous and I would be planning on an appeal. GMU threw Wegman under the bus with the help of USA Today, whereas Mann received and is still receiving a protective shield costing the Virginia taxpayer what will be millions of dollars in legal fees when everything is finally said and done. Skewer the skeptics; feed the faithful. It’s the AGW way. UVA’s position here is not at all consistent with the spirit of its founder Thomas Jefferson or with the pursuit of knowledge and truth. But this is the post-modern era in which fake but accurate stories dominate newspaper headlines and where models are presented (or should I say promoted?) in “scientific” journals as gospel truth. Glory Hallelujah! Amen! Me thinks that Mann doth protest too much. What amazing rubbish, supported by citing a cartoon as your ‘legal expert’! Is your given name Peter Fontaine? Or are you one of the #occupymeh comrades? Your argument has the same baseless ‘merit’ as Mr. Fontaines position on selective violation of FOIA. Regardless of whether any great revelations are provided by the ‘Far Out, Mann!’ emails and communications, it is paramount that the FOIA laws be complied with completely. Try to stay on topic, FtM, and at least minimally relevant in your comments. Yeah, I am sure that comment went over well with the Judge. It is an insult to the court to not have all that info either down pat or tabbed in front of you. To say. “…but it basically says…” – The attorney is SO losing points with the Judge. Judge Sheridan appears to be pretty astute. The ATI counsel was pretty thorough in nailing Mann as a non citizen and non-employee and therefore UV essentially waived rights when it sent Mann the tranche of emails that had not been already destroyed. Mann’s lawyers have no case to work with since UVA sent the emails to Mann. Everything they are arguing are shots in the dark – and insults to the intelligence of Judge Sheridan. They are trying to snow him, an he is aware of it. He might even be enjoying watching them make fools of themselves. It kind of sounds like he’s seen enough to already make a decision, and is just letting it all play out. It seems clear he is going to go with the letter of the law. If so, I wish there was a betting line in Vegas on this. No, Rocky, he isn’t a co-conspirator. He’s a lawyer, and he’s obligated to put forward a client’s case as effectively as possible. And what he’s doing is not lying. He’s just not giving the judge a reason to listen to his argument. It speaks much to the strength of Mann’s position that this is all his lawyer has got to take to the judge. If he had anything better, he would have used it. And because the law firm doesn’t want to have its reputation for court success sullied by an embarrassing, public and inevitable defeat, you get the third string, just out of law school rookie to take one for the team. Remember, Michael Mann, from his own writings, is a giant mass of self-inflated ego and hubris. I’ve seen it too many times before. These always get punctured severely in any court action. And yes, the judge nailed it right from the beginning. Motive has nothing to do with the legal requirements of FOIA. And unless his lawyer can come up with something other than the supposed bad motives of the petitioners, Mikey and the UVA are screwed. Steve Garcia, All of your post was dead on except for this bit. And they get VERY irritated with lawyers who don’t take the judge’s direction on these matters. I remember one judge who indicated as part of the court record his frustration with one plaintiff. The judge remarked that he discovered more about the merits of the plaintiff’s case from the defendants’ submission than the confused and irrelevant casse presented by the plaintiff. The judge was prepared to throw the whole case out on the very first day, but the defendants insisted that, such was the public nature of the near-slanderous statements by the plaintiffs pre-trial, they wanted the judge to make a finding of fact, not just a ruling. Unfortunately the Court denied the waiver issue and denied discovery so the two less difficult routes are at least temporarily .. off the table. I am not a lawyer, but it seems to me the important part of the transcript is these statements of the Judge which the transcript shows were agreed by all parties in the case. 1 record regardless of who prevails in this court. In other words, whatever ruling(s) the Judge makes, the case will be decided later on Appeal. And, therefore, the Court needs to place on record the pertinent points of law, the pertinent facts, and the points of agreement and disagreement between the involved parties. But any decision(s) of the Court do not matter because the case will finally be decided later and elsewhere. However, I suspect the findings of the Court will be spun for PR by both sides in the case. The transcript was a fascinating read and could easily draw me into becoming a court room junkie. There is a precision of language in the court room that evades the sciences, generally, and society, in toto. There is also a demeanor in the court that is profoundly lacking in the blogosphere, and that is the presumption of respect. The gravest of legal miscreants is granted equal footing until the finding or ruling is revealed. There is much we can learn from that. And for the record, I don’t accept this transcription, a single data point, to represent a trend in this regard. I’m surprised that the judge denied the waiver (without prejudice); as that issue is rather clear cut. I would’ve thought that he would have granted the waiver and then allowed UVA to request a temporary stay that the judge would then grant. That woud’ve forced UVA (and manny) to introduce evidence to overturn the waiver decision by a certain date. Instead the judge decided to deny the waiver and discovery so he could familiarize himself more with the exemplars and bring himself up to speed about Virginia FOIA. That is an odd decision. It seems to be a judge looking to CYA because he expects the case to go elsewhere and he want his dotted i(s) and crossed t(s) to be all perfect. Sort of like this case is giving hm a future resume point. From this persepective and the evidence on the table, if this case goes to Virginia’s Supreme Court; I think it is likely they’ll decide that the judge should’ve settled the case because of the email disclosure to Mann waives any FOIA exemptions claimed and remand it back to the judge to finish the case. Looks like a long road till complete. Maybe (hope?) we’ll get the password to the remaining cache of climategate emails sooner? Surely the whistleblower has some respect and desire for wanting the public to see those emails while everyone involved is still actively engaged and not yet senile? Discussions in the emails about uncertainty or dodgy methodology in relation to the hockey shtick will crash the entire gravy train. Anything else will be ignored by the prolls. So true, JEM, so true. Typo Anthony in your preamble. You describe the Hockey Stick as “science”! I’m sure you don’t mind me correcting you on this one. We should get a pool together on whats in there? I think it is equity in various green firms. Ouch indeed. Did the court reporter really transcribe the word “effect” instead of the proper “affect”? “I am the grammarian about whom your mother warned you”. Why do you think there is something in the e-mails? Mann just likes to fight, same as Phil Jones. If Mann just likes to fight, why is he afraid to debate, or take unscripted questions? And if Phil Jones likes to fight, why did he blubber about suicidal thoughts when the going got tough? Were the emails written by Mann done so via his University of Virginia email address? Was the computer that Mann used to write the emails, University of Virginia, a public university, and therefore property of the Commonwealth of Virginia? If the answer to EITHER of those questions is YES, then the emails written by Mann are damned sure subject to FOIA request, and NOT “private” emails owned by Mann. Aside from the odd quote encountered here and there, it’s been a good many years since I read any of Rand’s work, but as I recall some of her harshest criticism was leveled at industrialists who feed at the public trough. She lumped them in with the rest of the moochers. Her only fetish was for what she termed producers, regardless of station. After all the high-minded legal debate, it comes down to the definition of “is”. Perhaps legal assistance can be offered by Bill and Al, even though Bill lost his license to practice. It may be time to invoke the “its for the children” excuss a la Edwards or play the race card somehow. The most striking thing I remember from +30 years ago was how very efficient Rand was at reducing both mouth breathing collectivists and self-sacrifice promoting altruists into ranting fools. Those two types of ‘intellectuals’ had a ranting style that was similar to the typical Romm styled rants. My real point was that a copyright wouldn’t protect the email from a FOIA or use in a trial. Thus for Mann (or his lawyer or any others) to think that a copyright should protect them is silly. The point Mann’s lawyer makes about copyright is that his email could be exploited by someone else for IP issues. Big deal, the AG doesn’t care about that, and as Tom in Florida pointed out, the emails could be easily be copyrighted upon turnover to the VA AG. Again, his lawyer should be slapped down for being silly. Follow the Money : Have you even read any and Rand’s works? If you have, I fear you have wasted your time because you compleatly missed the point. Before trying to insult others, better make sure you first understand what they are saying. Dear Sir, I think your imagination quite limited in this regard, as I can think of many things that may appear beyond the HS; things which could end Mann’s career, discredit the University he works at, and severely damage the CAGW gravy train. I hypothesize that Mann is desperate to hide his massive funding from Fenton, which came from Soros. Remember that he left UVa because it would not hire his to-be-wife (Penn State did). He doesn’t work for free, and I’ll guess that his emails show that. This snippet encapsulates what it is really all about. Hiding these. The only question the Court needs to answer is did Mann do this work with private, or PUBLIC funding? The answer will determine whether it is “proprietary” or “Public”. Who wants to set up the reward fund for anyone who can produce (legally, of course) the unredacted emails, after Mann loses his case and complies in the manner of EAU? I would be happy to contribute. ….Instead the judge decided to deny the waiver and discovery so he could familiarize himself more with the exemplars and bring himself up to speed about Virginia FOIA. That is an odd decision. It seems to be a judge looking to CYA because he expects the case to go elsewhere and he want his dotted i(s) and crossed t(s) to be all perfect. Sort of like this case is giving hm a future resume point…..
No the Judge is doing exactly as he should. An appeal is not a NEW trial. All a court of appeals does is look at the information presented in the first trial and determine if the decision was correct based on that information. This is for Wisconsin but is pretty much the same for all states. …the primary function of the Court of Appeals is to correct errors that occurred at the circuit court level. The published opinions of the Court are binding precedent until overruled by the Supreme Court, and the Supreme Court has recognized that the Court of Appeals has a “law defining and law development” function. Cook v. Cook, 208 Wis. 2d 166, 188, 560 N.W.2d 246 (1997). Any citizen may appeal a final judgment or order of a circuit court. Appeals of nonfinal judgments or orders (those that do not end the litigation) are accepted at the Court’s discretion…. Coincidentally, on the same day as the hearing, the law firm representing Mann hired nine experienced intellectual property litigators. How much is this costing Mann, or is he getting his legal expenses paid? Perhaps the good Mr. Fontaine is working pro bono? This looks like a good subject for a FOI request. I just checked Mann’s book, pages 160-175 — the chapter which deals with the NRC and Wegman reports — and can assure you that he neither quotes nor refers to any emails obtained by Vergano from Wegman. Schnare just flat out lied to the court. And who, Your Honor, is this author? It’s hard to lie to the Court, when the opposition is present. And they apparently didn’t dispute Schnare. Better go do some more research. Um Smokey, I read every page between the first page of the chapter in which the Wegman report is discussed and the last (as I pointed out). This is a superset of the pages on which Wegman is mentioned in the index. Schnare lied, pure and simple. However,neither counsel for UVa, nor counsel for Mann was ready for such a blatant lie as they apparently hadn’t read the book yet. If you are right, it will certainly come out in the proceedings. There is no doubt whatever. Smokey, there aren’t going to be anymore proceedings on this. Further arguments will be in front of the VA Supreme Court. Hopefully the Respondents will be prepared for this specious argument if Schnare chooses to raise it again. BTW, I suggest that you visit your local library (or large bookstore) and read the 15 pages. You will see that I am right. I’ll take your word for it that the references were not in the 15 pages you cited. But if you will notice, Mann’s publication was not named. Have you read everything Man has written? If so, my sympathies [unless you like science fiction and fantasy]. Since no one else is backing your opinion, I remain skeptical. It will all come out in the wash. Or not. In either case, it does not change the central argument: no one objected when Prof. Wegman’s emails were provided by the university pursuant to an FOI request. You might look at this at the Bunny’s or click on the link and look at the letter. In the section of the transcript which you highlight, Schnare is, at least somewhat clearly, highlighting Mann’s recent book. Do I have to point out what you yourself highlighted? 1) Did UVa give up the right to claim exemptions for the documents by providing them to Mann’s counsel? (It should be noted that Judge Sheridan ruled against ATI on this FROM THE BENCH. 2) Did ATI have a right of discovery under the FOIA law to have access to these documents? If you look at the Bunny’s post you will see that the VA FOIA Advisory Council may have a very different view of the nature of the law than people on this blog. You might also see that Dan Vergano at USA Today was not satisfied with the response to his request. But the whole question of copyright is peripheral to the question of whether or not a document is exempt under FOIA. Schnare successfully raised a red herring, and you bit. Go argue your peripheral conspiracy theories with your bunny pal. I didn’t click your link; I’m uninterested. I am confused by the positions many warmist posting take on these FOIA cases. They think at it narrowly trapped to this one situation, throwing away any principles they might have had. Or did they have any? What would one expect of any future FOIA requests to happen – not on Mann and UVA but on any other case? Imagine for any FOIA citizens would have to pay many thousands dollars to authorities to maybe receive one tens of the documents requested after these are reviewed by the person in question for FOIA. Is this the new progressive understanding of the FOIA law? Is this what “they” would like to get when they come to FOIA requests? This might very well be the end of simply filling in the form and get the FOIA document requested from any authority. And even worse FOIA will be at the bosses decision. Another tool to make it happen at their own goodwill. It opens the gate to a lot of obfuscation, possibility to keep things in the dark not seen by the citizens eyes which leads to corruption. It ends the FOIA process as it was for obtaining the Wegman documents for instance. Yes, from the progressive POV, FOIA is, as Blair said, a terrible mistake, a veritable Pandora’s Box of horrors. The duct tape and Krazy Glue are being wielded assiduously.